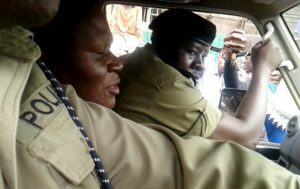 Mao is whisked away to Kampala Central Police station upon arrest. Courtesy photo. 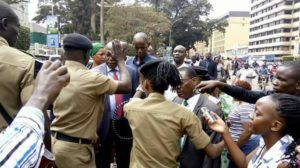 Kampala: Democratic Party president Norbert Mao was today morning arrested as he tried to launch a nationwide campaign against the lifting of the presidential age limit. The campaign dubbed ‘K’ogikwatako’ aims at rallying Ugandans against the suggested amendment of the 1995 Constitution to lift the age limit of presidential candidates from 75. Mao and his protégés were matching towards the Constitutional Square to commence the campaign — which translates ‘if you dare touch it”. They were rounded up together with a number of DP leaders including the Ag secretary general Dr Gerald Siranda outside the party offices at City House. MP Joseph Ssewungu (Kalungu County) engages in a verbal dwell with police who were dispersing DP supporters. Among the activities they wanted to kick-start was the collection of signatures of all Ugandans against the Constitution amendments. Mao is currently being held at Kampala Central Police Station. Before being arrested, Mao addressed journalists at the party offices and challenged Ugandans to disregard President Museveni’s comments yesterday that he wasn’t aware of the amendment plans. President Museveni told the media at State House on Wednesday that the said debate was a waste of time, and that he was not paying attention to it, but rather focusing on his work. But Mao rubbished this, saying Museveni is bent on staying in power beyond 2021. “You vaccinate those who are health so that in the eventuality of a illness, they are protected,” Mao said. “Our spirits and resolve are strong. The police should not manhandle our people who are constitutionally mandated to exercise their rights,” Mao added, as he called upon Ugandans to join in the struggle. According to Article 102 (b) of the 1995 Constitution, a person is not qualified for election as President of Uganda unless that person is not less than thirty-five years and not more than seventy-five years of age. In 2005, Article 105 of the Constitution was amended to extend President Museveni’s stay in power beyond the constitutional two terms. There is growing anxiety that the remaining check of 75 years will also be removed to guarantee President Museveni a life presidency.